There are some very interesting interpretations of the The Wonderful Wizard of Oz. There are the usual drug references, but most analysis focuses on the story being a political fable of the populist times. It is also interesting that the director of the Detroit Public Library System in 1957 wanted to ban the book because it was "poorly written," "unimaginative," "negativistic," and "unwholesome." I feel that there are many books much worse than The Wonderful Wizard of Oz but that is just me. 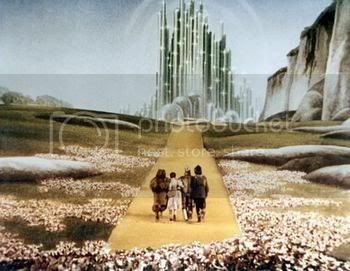 Going back to the story being a political fable for the Populist Movement, the theory was written by Henry M Littlefield and his article is entitled The Wizard of Oz: Parable on Populism. "Throughout the story Baum poses a central thought; the American desire for symbols of fulfillment is illusory." This article really brings a new dimension to the book with the characters, objects, and lands representing various people, events, and lands in real life. It all seems to fit nicely, but one has to wonder is that what L Frank Baum was planning or are we reading too much into it?